IKEA Free Food Days | A Savings WOW! Note: See your local IKEA store for details. Some restrictions may apply. Participation varies. Organic Pasta, BBQ Ribs, and Roasted Chicken not available at IKEA Carson. 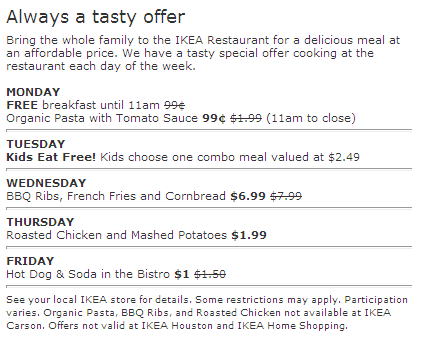 Offers not valid at IKEA Houston and IKEA Home Shopping. Find your local IKEA store location.